A range of multi-channel PCI-Express Digital Input/Output cards. The PEX-Dx series are non-isolated, while the other cards in this category are Isolated ones. Uses include factory/laboratory/industrial automation, communication switching. PCI Express Digital I/O card providing 24 TTL digital I/O lines, consisting of three 8-bit bi-direction ports. PCI Express Digital I/O card providing 48 TTL digital I/O lines, consisting of six 8-bit bi-direction ports. PCI Express Digital I/O card providing 56 TTL digital I/O lines, consisting of three 8-bit bi-direction ports. 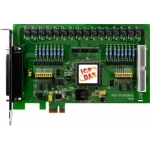 PCI Express Digital I/O card providing 96 TTL digital I/O lines, consisting of twelve 8-bit bi-direction ports. The 8-bit ports are named port A (PA), port B (PB), port C (PC) with all ports being configured as inputs upon power-up or reset. Isolated PCI Express Digital I/O Card with 8 optically isolated Digital Inputs and 8 relay outputs. Isolated PCI Express Digital I/O Card with 16 optically isolated Digital Inputs and 16 relay outputs. PCI Express Digital I/O Card with 32 channels of optically isolated digital inputs and 32 channels of optically isolated (current sinking) digital outputs, arranged into four isolated banks. PCI Express Optically Isolated Digital Output card with 64 channels of optically isolated Open Collector digital Outputs (Current Sinking), arranged into four banks. PCI Express Optically Isolated Digital input card with 64 channels of optically isolated digital inputs, arranged into four banks. Typically 12V input signals. PCI Express Optically Isolated Digital input card with 64 channels of optically isolated digital inputs, arranged into four banks. Typically 24V input signals.